Krishna wanted to show that life is a play, and that is what He lived, the perfect Leela. 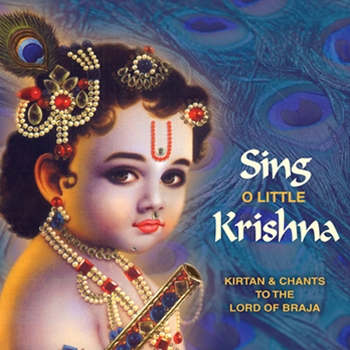 The sweetness and blessings of Krishna rain down in the form of music on this CD. Sing O Little Krishna is a magical offering of love and devotion. Just like the butter thief himself, each chant has a playful spirit that awakens genuine joy in the heart. From start to finish the album exudes such sweetness, and Sita Stuhlmiller’s uplifting voice creates an atmosphere of pure delight. Thank you for this lovely invitation to join in Krishna’s blissful leela! These delightful Hindi bhajans and devotional chants in English celebrate the divine pastimes of Sri Krishna, the incarnation of Love. Most of these chants were recorded during our annual celebration of Janmashtami (Krishna’s Birthday) at Sacred Mountain Ashram in August 2011, with additional voices and instruments added. Sung by Sita Stuhlmiller with guitar and synthesizer and accompanied on percussions by Chetna Geller, these chants fill our hearts with the sweetness and joy of chanting the Lord’s Name.